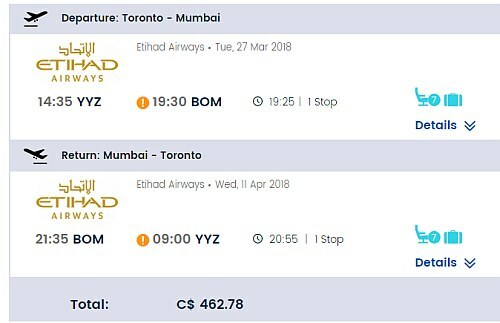 Etihad Airways is showing what appears to be mistake fares from Toronto to various cities in India. Update @ 6:00 PM EST - I've been hearing from quite a few people that they are unable to complete their purchases for these flights, on any booking site. Sorry everyone, it looks like these are not bookable. NOTE: After your Skyscanner search completes, you may see results from other booking sites instead of from Gate1.ca. Some of those prices will appear to be even cheaper. None of these sites are ideal for booking mistake fares. Gate1.ca would probably be my first choice, as I've seen them come through on mistake fares in the past. One booking site showing these mistake fares that never works is CTrip. It will give you an error message once it tries to verify the price. I have my doubts that any of these sites can actually issue the tickets, but every mistake fare situation is different, and you just never know. 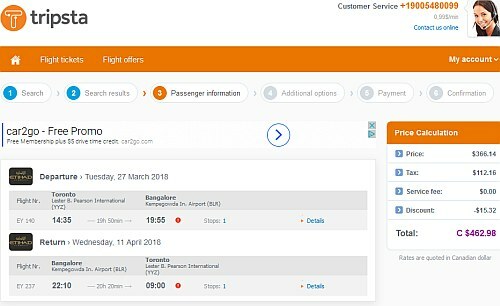 And lastly, you may need to try the second or third result from the top of the Skyscanner search results, not just the first result. Listed beside the price, you'll see the travel durations, in hours. For longer trips, you can try mixing and matching the dates from different lines in the list below. It's well worth trying your own dates, as I'm sure there are many more. You may want to try starting with Tuesday and Wednesday dates. I'll keep adding as many examples as I can. What can you tell me about Gate1.ca ? Gate1.ca only started showing up on Momondo about 10 months ago as a partner booking site, but they are actually owned by tix.nl (you can see this on their contact page). Some of the larger booking sites around the world create 'spin-off' booking sites that are dedicated to specific markets or countries. The tix.nl reviews on TrustPilot seem better than most booking sites. It appears that tix.nl actually responds to reviews, which is definitely more than can be said for most sites. Gate1Travel.ca has no relation to Gate1Travel.com - a somewhat well known tour company in the U.S. I have seen mistake fares on Gate1.ca before (particulary with All Nippon Airways), and in those situations, they were able to issue the tickets just fine. 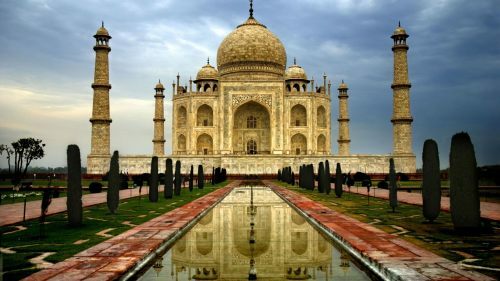 But every mistake fare situation is different, so definitely *DO NOT BOOK ANYTHING ELSE* and wait at least 24-48 hours after booking to be sure that everything is fine. Update @ 6:00 PM EST - I've been hearing from quite a few people that they are unable to complete their purchases for these flights, on any booking site. Sorry everyone, it looks like these are unbookable. 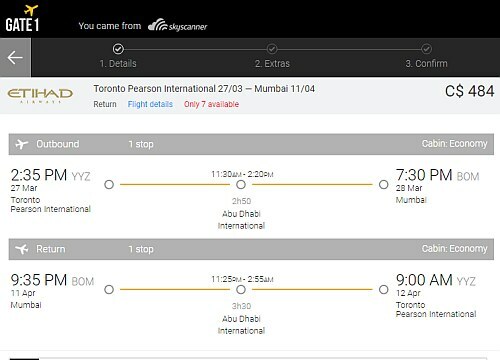 3 Responses to "** not working ** Toronto to places in India with Etihad Airways - $484 to $563 CAD roundtrip including taxes | mistake fares"
Tried multiple dates from skyscanner, then tried to completed with various OTA and no dice. Ethiad caught their mistake and quickly pulled it. looks like it's corrected now. thanks to chris for the find, in any case. was exciting to try!